Unless you’ve been living under a rock like the worm the mighty Cthulhu believes you to be, you probably know that H. P. Lovecraft (1890 – 1937) was an American author of horror and science fiction stories. As you might also know, much of Lovecraft’s work expounds the notions that the true nature of reality is incomprehensible to the human mind and, consequently, that the human race is irrelevant in the overall scheme of the universe. In a typical Lovecraft story, such as his well-known tales “The Shadow out of Time” and “The Call of Cthulhu,” a human protagonist is usually the victim or the plaything of a race of ancient and malevolent otherworldly beings—which are referred to as the Old Ones or the Great Old Ones, and of which Cthulhu is one of the most powerful—who consider the human race to be only marginally higher on the evolutionary scale than insects or worms. Lovecraft’s stories were largely ignored by the literary mainstream during the author’s lifetime, and not surprisingly, most of them were therefore first published in pulp magazines such as The Vagrant and Weird Tales. Since his death, however, scholarly interest in Lovecraft has grown steadily, and respected literary figures such as Jorge Luis Borges, Joyce Carol Oates, and Stephen King have acknowledged their admiration for Lovecraft’s work. Possibly because of this growing literary interest, or perhaps in spite of it, Lovecraftian tropes increasingly show up in the products of Western pop culture, including successful movies such as Sam Raimi’s Army of Darkness and Guillermo del Toro’s Pan’s Labyrinth; comic books such as the original Batman series; episodes of popular television shows such as Star Trek, Hercules: The Legendary Journeys, and The Simpsons; and even the venerated artwork of Swiss surrealist painter H. R. Giger. With all the Lovecraft references in films, comics, TV shows, and fine art, it should come as no surprise that Lovecraftian elements have also shown up in the realm of popular music. Indeed, the Canadian rock band The Darkest of the Hillside Thickets, which has been together in one incarnation or another for over seventeen years, has built a successful career out of writing, performing, and recording music that is based primarily on Lovecraft’s work. This means, of course, that the Thickets—as they are affectionately known to their fans—sing about the Great Old Ones and the other horrors that threaten human existence in the Lovecraftian mythos, but unlike their literary inspiration, they often take a tongue-in-cheek or jocular attitude towards humanity’s lowly position in the overall scheme of the universe. And in addition to singing Lovecraft-inspired lyrics, the Thickets also put on outlandish stage shows that include costumes depicting the Great Old Ones, Greco-Roman mythological characters, and other over-the-top horror and sci-fi regalia. 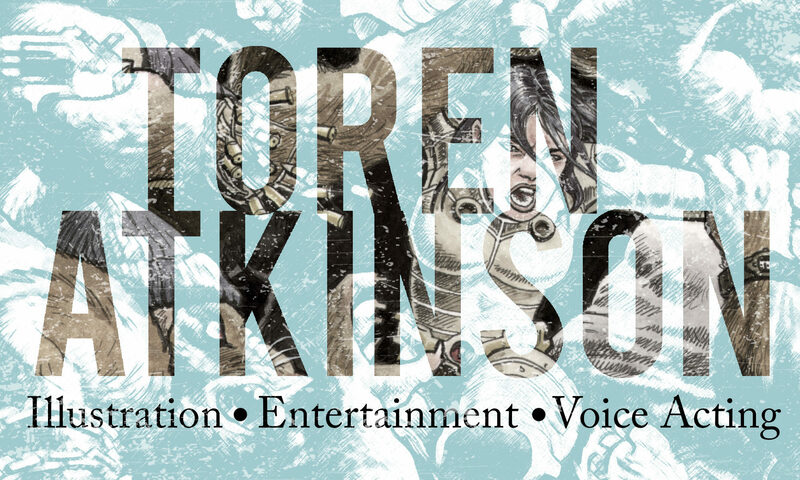 Toren Atkinson, front man and lead singer for The Darkest of the Hillside Thickets, is also an illustrator, an actor, and a creator of role-playing games. He recently took time out of his busy schedule to talk about his band, their history, and life as the lead singer of the world’s foremost Lovecraftian rock band. The Darkest of the Hillside Thickets have been performing and recording together for more than 17 years. What’s the story behind how you guys got together? And why a band based on the works of H. P. Lovecraft? Your albums sound very accomplished and polished, so you guys obviously notched it up on the musicianship scale. What kinds of things did you and the other band members do to polish your musical skills? Practice, practice, practice! Actually, one integral part was the addition of real musicians to the lineup as the years went by. I think I am the only one in the band who still can’t actually read music. Speaking of the band’s members, who are the musicians behind The Darkest of the Hillside Thickets? The original lineup only held for the first one or two shows. Devon Presseau, who was also in our gaming group, played bass for a year or two, and during that time, we also gained the drummer from Mystery Machine, Jordan Pratt, who remains our drummer to this day. My brother Merrick, who also had a band around that time (Chilliwack was a very fertile musical spawning ground in those days), joined as one of our “goathead singers,” and he has stayed on throughout the band’s career. When our bassist was having trouble hitting some of the notes, my brother’s professional photographer friend, Bob Fugger, stepped in to help, and we realized Bob would make the perfect bassist. Bob stayed in the band for several years, but family and career obligations finally pulled him away. In between our albums Spaceship Zero and The Shadow out of Tim, we added a second guitarist, Mario Nieva, and Merrick stepped in for bass guitar duties. While we were writing and recording The Shadow out of Tim, Warren was living in Derby, England. We sent him our practice recordings through the internet, and he flew in for the studio recording sessions. I’ve noticed that the liner notes on Thickets’ CDs don’t clearly credit individual authorship for the original music. Do you personally write most of the songs, or is it a group effort? Though I write 95% of the band’s lyrics, the rest of the musical writing is definitely a group effort. Usually when we practice, one or more of us will come with some melodies and riffs we’ve cooked up over the past couple weeks, and we “jam it out” until we either get a song or we get sick of it. I should also point out that I’m not above calling out to the fan base to help us with certain special lyrical tasks. For example, for “The Math Song” and “Dies Ist Unverschamtheit”—both on our album Spaceship Zero—I had a brain friend help me with the algebraic equation and the German lyrics, respectively. On The Shadow Out of Tim, I put the call out online for help with writing the Middle Egyptian lyrics for the song [about Lovecraft’s pharaoh-like god] “Nyarlathotep,” and two learned ladies, Inanna Gruner and Cristina Rizen, really came through for the band. I know the band’s name comes from a line in a Lovecraft story. Exactly which story, and why did you choose that particular moniker? The full quote is from Lovecraft’s short story “The Tomb”: “I will tell only of the lone tomb in the darkest of the hillside thickets; the deserted tomb of the Hydes, an old and exalted family whose last direct descendant had been laid within its black recesses many decades before my birth.” Before The Thickets [as a band] even became an idea, another local band—which eventually became Eugene’s Axe [and was] fronted by Jordan’s brother Josh—was looking for a name. I wrote a page-long list of potential band names, and some of them came from Lovecraft stories. When we started our band and were looking for a name, we all remembered that The Darkest of the Hillside Thickets had really stood out on that list. If Eugene’s Axe had chosen The Darkest of the Hillside Thickets first, who knows what we would have been called? The Patriots of Yith or something. Since the band’s music is inspired almost entirely by the works of H.P. Lovecraft, what kind of problems have you faced in getting the music recorded and marketed? As a “gimmick” band, we have noticed that many promoters or producers who take music extremely seriously give us the brush-off, but since the band doesn’t take itself seriously, we’re not really too broken-hearted about such treatment. Actually, during the 17 years we’ve been a band, we’ve noticed that “Lovecraftiana” has gained a lot of popularity and that nerdiness in general has become big business. So I think it’s owing to our geeky aspects and Lovecraftian connection that we’ve found some degree of success. I personally discovered The Darkest of the Hillside Thickets six or seven years ago while searching for info about Cthulhu on the internet, and I’ve been a huge fan ever since. How important has the internet been in promoting the band? We don’t tour much, and back when distribution through record stores was more important than it is now, we didn’t have much representation. But we’ve had an online presence since the early days of the World Wide Web, and it’s more important now than ever for artists to have their art available through the internet. We’ve made Thicket-themed screen savers, video games, and exclusive tracks available via the internet, and there’s no doubt that this has been key to our promotion. The Thickets have a reputation for wearing elaborate costumes, most of which are based on Lovecraftian characters, during live performances. How did that come about? And who makes the costumes for you? As I mentioned before, we had no musical experience when we began, so we knew that we would have to really play up the Lovecraft angle. Putting on a good show and having fun, no matter what the quality of the music, has always been our main goal. During our first decade, we made almost all of the costumes ourselves, but on occasion, we have had professionals tailor some of the more involved costumes—like our satyr costumes or my giant blue gug [a creature from Lovecraft’s novella The Dream-Quest of Unknown Kadath]—when real sewing skills, not just foam and rubber cement, were called for. Which of the various costumes is your personal favorite? I think my space lamprey is my favorite, and it’s also been one of the most problematic. It’s essentially a 10-foot-long Styrofoam worm that I wore as a hat for our show [inspired by Lovecraft’s short story] “From Beyond.” Over the years, our costumes have become less awkward but hopefully no less ostentatious. I learned that the stage is always smaller than you anticipate when you’re making a costume, and antennae and long, trailing tentacles are not always the most practical form of artistic expression. As for humor and fun, a lot of the band’s earlier music included sound clips from old cartoons and TV shows like Star Trek, as well as stuff from films like Daniel Haller’s 1970 Lovecraft adaptation The Dunwich Horror. I don’t notice any sound clips in The Thickets’ latest CD, The Shadow out of Tim. Is that an indication of the evolution of the band’s sound, or will there be a return to the use of sound clips in future projects? Actually, when we were cutting a second pressing of our first CD, Cthulhu Strikes Back, with our new (at the time) record company Divine Industries, we received some resistance from the pressing plant because we didn’t have any paperwork on hand to illustrate that we had the rights to reproduce those clips. As a result, when we recorded our next CD, Spaceship Zero, we actually wrote and recorded the “samples” that are credited [in the liner notes] to the “original” movie and radio plays. I definitely see us returning to the use of [genuine] old sound clips on future albums, but I think we’ll be more legally conscious in our choices. Your comment about Spaceship Zero intrigues me. The CD’s liner notes imply that the album is the soundtrack for an actual film, and I’ve actually read material on the internet that “confirms” this. But if I understand you correctly, you’re saying that no such film or TV show actually exists? There was never a Spaceship Zero movie, nor was there a TV show or radio serial upon which that movie was based. The entire [soundtrack] concept is a hoax, although there is a very real role-playing game, published by Green Ronin Publishing out of Seattle, which Warren and I co-wrote. I’m also producing a small Spaceship Zero comic book, which will be published in an anthology by Cloudscape Comics in early 2010. But I know that The Thickets’ music has actually been used in a few TV and movie soundtracks. What are the titles of those films? Apart from indie films—usually Lovecraftian ones like The Casting Call of Cthulhu, which used our song “Some Things Man Was Not Meant to Know”—our song “Slave Ship” can be heard in the SciFi Channel movie Bloodsuckers (a.k.a. Vampire Wars: Battle for the Universe). We’ve also had some success in video games: “Some Things Man Was Not Meant to Know” appears in the credits of the video game Penny Arcade Adventures: On the Rain-Slick Precipice of Darkness: Episode 2, and an unannounced song will appear in Kerberos Productions’ Fort Zombie. While we’re on the subject of video games, I’ve heard rumors that one of the songs written for The Thickets’ latest CD, The Shadow out of Tim, was recently included in a downloadable extension for the popular video game Rock Band. What’s the story behind that? A song called “Shhh….” was one of the tracks we didn’t use on Tim because it was topically distinct from the narrative of the album, but we held on to the track under the assumption that something would come up…where it could be used as some sort of promo. And indeed, when we were asked to play the Penny Arcade Expo in Seattle, we learned that the organizers were working with Harmonix to put together a pack of downloads for Rock Band, and it was to include music by the bands playing at the convention. We were one of three bands asked to be part of the package, and of course, we were overjoyed. Harmonix had originally asked to use our song “The Innsmouth Look,” but since it was recorded using antiquated technology, it would not allow the programmers access to the song “stems” within the time required for the project (release date was the weekend of the convention). So we offered them “Shhh….,” which had the added benefit of being previously unreleased. I’ve also heard rumors that you, Toren, are a talented graphic artist. Do you do the artwork for all of the band’s CDs, t-shirts, and other promotional materials? I have done artwork for most of the band’s merchandise, and I happen to have a day job at a shop that prints t-shirts, which is quite handy. Some of the best Thickets-related artwork, however, comes from professional painter Chris Woods. He created the hyper-realistic oil paintings of the band in the cockpit of the Millennium Falcon that appeared on the back of Cthulhu Strikes Back, as well as the cover of the Spaceship Zero CD and the related role-playing game. In what ways has being the front man and lead singer for the world’s foremost Lovecraftian rock band conflicted with your day jobs? I had a temp job with a bank that lasted for about ten months. It was the most money I’d ever made, and after I was laid off, I planned on living off the cache and doing my own creative stuff. But when the t-shirt shop went up a scant two blocks from my apartment building, I applied there for the job of production designer, although I’ve ended up doing every kind of job imaginable in a small business except the accounting. Mostly, though, I do the design and prep work for the various garments and whatnot that we imprint. When I was hired at the shop, I specified that I required flexible hours and that I didn’t want to work more than 25 hours a week. That way I could work on my art and, if need be, take off time for auditions and whatnot. That arrangement has held for over three years now. I know you do a little acting, too, as I saw you in an episode of the Sci-Fi Channel’s TV series Stargate: Atlantis. What other shows and films have you appeared in? I’ve appeared in a few independent productions and some commercials, but my favorite form of acting is voice acting. My voice has been in a Barbie commercial and a Toyota commercial, as well as in video games like Sword of the Stars and cartoons like Mr. Dink and Captain Paycheck. It’s a lot of fun. Speaking of films and video, I’ve heard a rumor that there are plans for videos based on songs from The Thickets’ latest CD, The Shadow out of Tim, specifically one based on the song “A Marine Biologist” that will include footage of real-life marine biologists. What the truth behind that rumor? I love science and want to create a music video that is less about typical rock posing and more about showcasing real scientists doing real science. I have been in contact with and secured footage of several marine biologists, but we’ve so far been unable to secure any grants to get the filming done, so the project has been more or less on the backburner. Our aim is to have the video completed in time to include it on a supplemental DVD that will be packaged with our next album. That DVD will also include the winner of our Most Eldritch Video Contest on Earth. A new CD/DVD package from The Thickets—that’s awesome news. When can fans expect it to be released? I wouldn’t want to anticipate a date until we get closer to finishing [the] writing. What other exciting things can fans expect from The Thickets in the near future? After we had our song on Rock Band, we decided to do a Rock Band contest at a local theater, with the climax being that the contest winner would join us on stage for a live performance with the band. We added in some films and called [the event] Cthulhupalooza. We were even sponsored by Jones Soda, which provided hundreds of bottles of pop featuring various Thickets art and photos [on the labels]. So we’ll be doing Son of Cthulhupalooza [in 2010], and it will again be held in Vancouver, BC, though there will be some differences between this one and the last. There won’t be a Rock Band video game component to it this year, [but] there will be a much larger Lovecraftian film component. Plus, we’re looking into [doing] a Cthulhu bake-off, which should have unspeakable implications. Next PostNext What’s the Harm…in A Truffle Divining Rod That Also Detects Explosives?